For people with moderate to severe sleep apnea, lifestyle changes alone are often inadequate to correct sleep apnea. A medical device called a CPAP machine may be prescribed by your physician. With successful treatment, people with obstructive sleep apnea (and their spouses) can enjoy more restful sleep and greatly improved health. The respiratory therapists at Aeratech Home Medical provide CPAP machine set up, training and mask fitting along with clinical support for any questions or concerns. Our customer support and respiratory therapists enable patients to take control of their own treatment through our detailed CPAP supply program, including sending out reminders when you’re due for your next round of CPAP supplies as approved by your insurance. Aeratech Home Medical offers all your CPAP supply needs. We carry all the top and new styles of CPAP masks from Res-Med, Respironics and Fisher & Paykel, including CPAP tubing and filters. Aeratech Medical is proud to offer the latest and greatest in CPAP machine, the ResMed AirSense 10 AutoSet CPAP Machine with Integrated HumidAir™ Heated Humidifier. This CPAP machine combines the proven technology of the AutoSet algorithm with the integrated comfort of the Optional ClimateLineAir Heated Tube. The ResMed AirSense 10 is an auto titrating CPAP machine with an auto-adjusting pressure therapy device that adjusts the pressure on a breath by breath basis to deliver the minimal pressure needed to maintain the airway. It is integrated with a heated humidifier, wireless communications and advanced event detection (which includes central sleep apnea and Cheyne-Stokes respiration detection). Optional pulse oximetry monitoring is also available. The AirSense 10 AutoSet feature is able to differentiate between obstructive and central apneas and can also detect Cheyne-Stokes respiration, providing consistent, appropriate therapy and pressure. The ResMed CPAP machine’s advanced algorithm is proven to provide effective therapy on a breath by breath basis accounting for flow limitations. Pressure is smoothly increased over the duration of the limitation and decreases again when the event clears. This is beneficial for active sleepers who experience a great number of events when changing position during sleep. 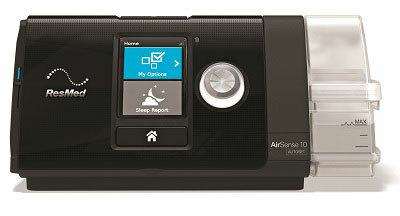 The AirSense™ 10 AutoSet CPAP machines can be set to automatically adjust or to a single pressure mode if desired.